UN House Bombing: Boko Haram claims responsibility! Islamist extremist group, Boko Haram has claimed responsibility for the UN bombing in Abuja. A caller told the BBC on phone that it carried out the attack. Also, another Boko Haram ‘spokesman’ claiming responsibility for the deadly attack said, they were guided by the wisdom of Allah. “Through the wisdom of Allah, we have launched the attack with absolute precision,” the man who identified himself as Abu Darda said in a telephone call to an AFP journalist. The veracity of his claim could not be verified.”We will provide details of the martyr who carried out the suicide attack,” the man said. 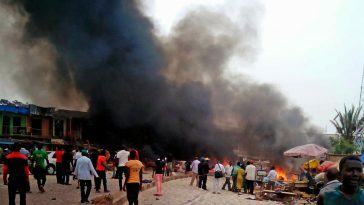 This marks the first attack on the U.N. by militants in Nigeria. Past attacks by Boko Haram, a group that models itself on the Afghan Taliban, have been launched on national government targets, mainly in the north. The largest previous bombing, of the police headquarters in Abuja in June, killed six. Previous article UN House bombing: Obama calls attack ‘cowardly! UN House bombing: Obama calls attack ‘cowardly!